If you had to cross this road on your walk to work, wouldn’t you rather drive? Millions of Americans live in communities without safe places to walk. And so they either don’t walk, adding to traffic congestion with every trip, or they do walk, risking joining the ranks of the 47,700 pedestrians killed and 688,000 injured in crashes with automobiles in the last decade. Does the disproportionate vulnerability of senior citizens explain Florida’s abysmal rankings on pedestrian safety? The report ranks metro areas according to a variety of metrics, but by the most basic one – “most dangerous” – Florida takes the cake for the worst pedestrian safety. Pedestrian safety is often perceived as a strictly local issue, but 67 percent of all 47,000+ pedestrian fatalities from 2000 to 2009 occurred on federal-aid roadways — major roads eligible to receive federal funding for construction and improvements with federal guidelines or oversight for design. Taxpayer money that goes to the federal government and is distributed to the states for transportation should be used to build streets, roads and highways that are safe for all users. With millions of Americans walking along and crossing these federally funded roads each day, the billions in federal dollars spent on them each year must result in safer conditions for pedestrians. The problem is too many federal-aid roadways. On a trip last year to suburban Louisiana, we spend about half an hour trying to figure out how to get to the restaurant across the road from our hotel, about 200 feet away. It became clear that the only workable solution was to drive about a mile to the next intersection, make a U-turn, and drive back. A 4 mile trip to go 200 feet without being run over. That road photo reminded me of an RV park in a suburb of Portland OR. The good news is that the park is located on a Tri-Met bus line, very handy for those who don’t tow a small vehicle behind our motor homes. The bad news is that to go downtown, one must cross Pacific Highway, almost as wide as the road in the picture, with no signals and no official crosswalk. Fortunately, I move rather fast for an old guy, but it was still “nervous time”. I should add that on one inbound trip, there was a bus failure, and a couple of other “intending passengers” and I had to wait nearly an hour for our ride. Then on a return trip, the air suspension on the bus failed and we had to wait for the next one. Most states recognize unmarked crosswalks as having the same legal meaning as a marked one. No state ever enforces it. In the picture above, that pedestrian may very well be in an unmarked crosswalk (hard to tell if those are all driveways or if any is a road), but not a single vehicle will stop. Heres the odd thing: Many locations design streets, just live above, but instead of a center turn lane, they place a medium with sporadic turning lanes. Now, no where under the law does it say that a medium voids the unmarked crosswalk, so that still exists. But now theres a wall in the way. Isn’t that a major ADA violation? Why haven’t highway departments been sued to hell and back for their design? They’re placing curbs and trees in the middle of a crosswalk! They’re forcing wheelchair users to detour .5 miles, while the able bodied can pass through the medium. That sure as hell sounds like an undue burden to me. injury for children 15 and younger, according to CDC mortality data” — something that bothers me is the fact that one of the CDC’s two Atlanta campuses is located on the very road (Buford Highway) pictured at the top of this post. For an organization that recognizes the risks of pedestrian-unfriendly environments and the ills associated with car dependent lifestyles, I expected a better choice. Just like so many other organizations in metro Atlanta, they picked an office space in a car-dependent area hostile to pedestrian and cycling mobility. There’s a conflict that transportation officials rarely discuss in public. Improving facilities for pedestrians attracts more pedestrians. More pedestrians increase the number of collisions and that makes transportation officials look bad. So what often happens is a “benign neglect” for pedestrian amenities. 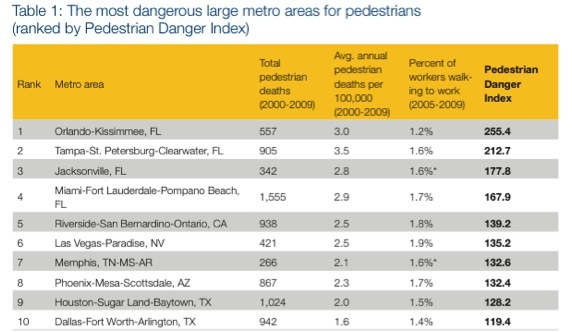 This article uses the right metric : Pedestrian Danger Index. More pedestrians don’t necessarily increase PDI and intuition supports that adding more pedestrians alone should decrease PDI because motorists would be more aware of the collision risk. I wonder what the PDI is for pedestrian intensive cities like Cairo and Mumbai. Despite the seemingly chaotic traffic I would not be surprised if PDI is lower than in our “calmer and more organized” USA cities. Many U.S. suburbs were built during a high crime era, after the courts struck down loitering laws so you couldn’t arrest people on a sidewalk because the looked like they didn’t belong, at a time when it was assumed that criminals did not have their own cars. The whole idea of many of these areas was to be inaccessible to anyone below the middle class. They didn’t want that person walking across the road being able to walk to their subdivision. They probably didn’t want him in their town to begin with. And now, as the world changes, these areas may become unlivable for the middle class. The PDI is a step in the right direction, but it’s not good enough. It’s based on a commute mode share, whereas in large, walkable cities like New York there are many people who take transit to work but walk a lot for other trips. If I had to go by one metric, it would be distance walked per capita per day. And so a car came and got me and took me across the street. It was so unbelievably depressing! And everyone I met with was so amused by my befuddled reaction — and finally did say stuff like “well I guess it is weird that you can’t cross the street.” YES. IT IS WEIRD. It was like a five lane street in the middle of the city with a giant grass filled meridian, very infrequent stoplights and exactly zero crosswalks. Highways in disguise. Pedestrian overpasses on roads like that every few blocks pretty much solve the problem, albeit at great expense. Of course, they’re not built because hardly anyone walks anyhow in places like that. Most things just aren’t within walking distance. I had something similar happen on a business trip to Virginia in 1990. I ended up walking from my hotel room 5 blocks to get something to eat with great difficulty, but honestly the place just wasn’t designed for walking. I could never live in a place like that. To me walking to the store is such I normal part of my routine I couldn’t imagine not being able to do it. Painted crosswalks with rigorous enforcement also solves the problem, and could potentially pay for itself with fines. So how is it that the LAB ranks Florida as the 7th most bike-friendly state. I see why you would assume nobody walks in places like that, but you’re wrong in this case. The street shown is Buford Highway in Atlanta, which actually has a lot of pedestrians and one of MARTA’s most popular bus routes. The city has been installing HAWK signals mid-block to allow pedestrians to cross. There is still a huge issue with this road though, because traffic often speeds and in some places there are no sidewalks at all. Perhaps other factors are contributing to offset the traffic fatality criterion. Good climate, predominantly flat terrain, scenic paths, etc. Rankings can easily be influenced by which factors to incorporate or to prioritize. I do agree in general with the data above as roads and town planning in Southern states are based heavily on automobile traffic. It doesn’t look like the criteria include factors like cyclist deaths, or the number of cyclists using the facilities. The criteria include items like driver education, spending, infrastructure, and policies. short of a “catch and release” program to randomly monitor people, how would you measure something like distance walked per capita? @7cf4b37ec2d4158b684563a183dcc335:disqus : You could just poll people and find out how much they walked. To make the statistics more meaningful, you should also ask them how much error they think is in their answer and then weight more heavily in your results the ones where people are confident in their distance. But certainly people have a very good idea of how much *time* they spend walking, and we know what the average walking speeds are, so we can also use that. The point is, it’s easily something we can figure out … if we *want* to. Look at how much effort people put in this society into figuring out other data sets like how many hours of TV people watch, or how many hours in a car, etc. I recall reading that in the early part of the century, when automobiles were only beginning to make inroads in cities, there would be an average of several people, especially children, killed every day on the streets of New York. Fatalities were similar to today’s, despite the number of cars being several orders of magnitude smaller. Actually there have been good empirical studies that show when pedestrian (and bicycle) numbers increase that their respective crash rates go down, NOT up. Overpasses are a car centered solution. The elderly and disabled can’t use them. They’re not safe for children. Street-level crossings, less signage, and rigorous enforcement by camera and cop are key. And please also factor in the wait time required for walk sign. To go to nearest railway station (some 1/2 mile) I had to cross 2 signals and it used to take forever. I believe sky walks would be a better option in such places. Also, part of reason is culture, since no one walks no one cares. Great writing! Thanks for exposing this information. Just slightly little off-topic, I’d like to comment that roads like the one pictured (Buford Hwy) are also highly dangerous for bicyclists. I often hear on this site that pedestrian overpasses/skywalks are car-centered solutions. I fail to see how. What’s the alternative? Waiting for a gap in traffic to cross? Or even worse, a signaled intersection where you might have to have a long time for a walk signal, and even then you’re at the mercy of whether or not cars stop on the red? Pedestrian overpasses (with ramps, so the disabled can use them) are a better idea. No waiting to cross, and you cross with 100% assurance you won’t get hit by a motor vehicle. The headline is perfect. It really applies to the case in Atlanta where the mother was charged for her son’s death when they had to cross a multi-lane road with no crosswalk or traffic signal. To make it better, that is where the governmental geniuses placed a bus stop. To guarantee people would be getting out at a location where they could not cross the road. As you said, they build roads to kill pedestrians. I walk to work, a mile and a half. It is along a 6-lane road, 45mph limit, with no sidewalk. I have to cross a street or driveway 18 times. The intersections alone account for 24 lanes of traffic I have to cross. I have to pay attention because the drivers don’t. I have to stop in the middle of the crosswalk with the light in my favor almost every time to avoid being hit by turning cars. Can’t cut through side streets because it is all suburban cul-de-sacs and winding neighborhoods. I see a lot of people walking to work, same as me. I saw a woman in a wheelchair in the bike lane, what else was she to do? The street shown above should have sidewalks–dim-witted traffic engineering, indeed. The don’t care at all about how difficult, stressful, or dangerous it is to walk around that neighborhood.